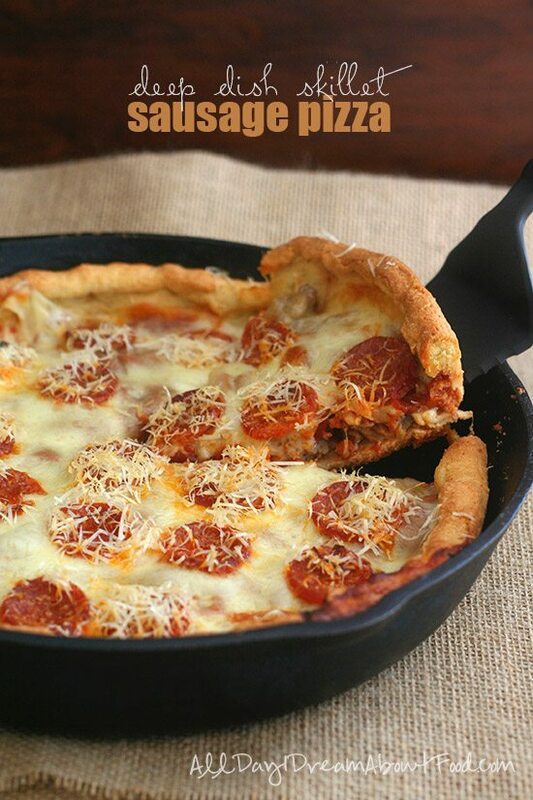 A deep dish Chicago-style pizza made low carb and gluten-free. This is the low carb pizza recipe you’ve been looking for! This post is sponsored by Jones Dairy Farm. Ask most people who have recently begun low carb diet what they miss most and a huge percentage of them will say pizza. And can you blame them? Really, who can resist the smell and taste of ooey, gooey melted cheese atop a tender, bready crust, preferably dotted with plenty of meats and other delicious toppings? There’s so much to love about pizza and so much to mourn if you think you can never have it again. I am now an old-hand at the low carb game and I can resist a lot of temptation. I can smile politely to my server at a restaurant and decline the bread or the offers of dessert. I will happily ask for my burger to be served without a bun, because it’s the meat I’ve always liked best anyway. I can pass up the pancakes and waffles at a breakfast buffet in favour of the eggs and bacon. I am pretty good at this low carb thing, but pizza admittedly tests my strength of character. It smells so darn good and although it’s the toppings I like best, eating the toppings without the crust is kind of anticlimactic. 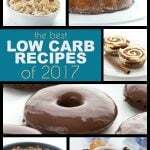 Now, I’ve made some really great pizza alternatives, as have other low carb and paleo food bloggers, and I have been pleased with my efforts heretofore. 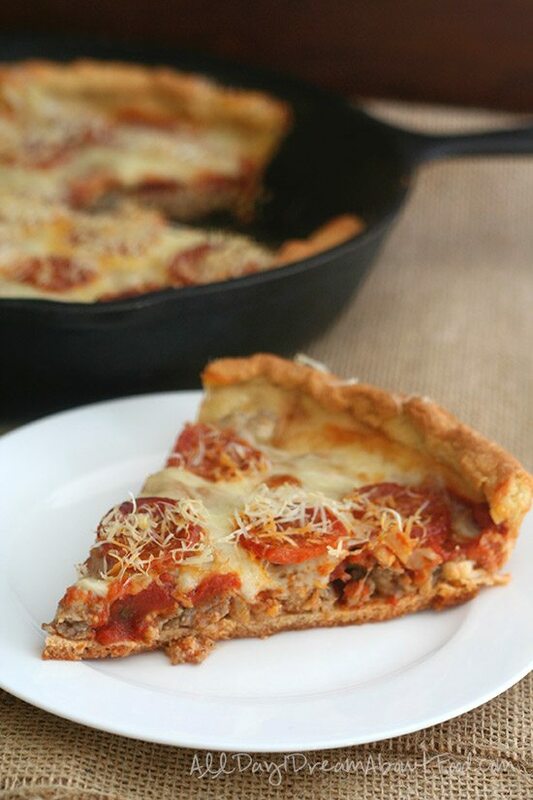 But this low carb deep dish pizza takes the cake. Or rather, it takes the pie. This is truly a “pizza pie”, with a tender-crisp crust and filled to the brim with goodies. It’s Chicago-style, of sorts, because of course I didn’t even attempt to make a flour-and-yeast based crust – that would be breaking the low carb code of ethics. 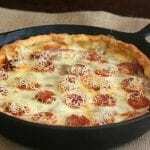 But it’s definitely Chicago-Style deep dish pizza in spirit and I think you will love it. And what I loved about it is the way the toppings take precedence over the crust, because there’s just so much of them, but the crust still has great flavour and plays its part in keeping the whole thing together. You can eat this with a knife and fork, certainly, but if you let it cool a bit before serving, you can also pick it up with your hands. I made this delightful thing because the folks at Jones Dairy Farm reached out and asked if I wanted to partner with them and showcase some of their pork products. I’ve started noticing their white and green packaging in some of my local grocery stores, giving other brands of sausage and bacon a little competition. And good competition it is too, because Jones Dairy Farm is made without many the icky additives of other brands. Their all-natural pork sausage roll, which I featured in this recipe, contains 4 ingredients: pork, water, salt and spices. No high-fructose corn syrup, no MSG, and many of their products are certified Gluten-Free, making it a much healthier choice. I’ve had this recipe in my head for a while now, so armed with a few rolls of Jones Dairy Farm sausage, I got to work. Originally I thought it might be fun to use my Cheesy Drop Biscuits as the crust. But the more I thought about it, the more I wanted the sausage, mozzarella and other fillings to take center stage. So I opted for an adaptation of the crust from my Mini Brie and Bacon Tartlets and I am so glad I did. With a little pre-baking, it crisped up nicely and it held up admirably to the fillings. Unlike flat pizza, the trick to deep dish is to layer your cheese and meat at the bottom, so the sauce doesn’t make your crust a soggy mess. And sliced mozzarella instead of shredded helps you create a good barrier between sauce and crust. I decided to throw a few slices of pepperoni on ours, to appeal to my kids, but another layer of sausage would be great too! This post was sponsored by Jones Dairy Farm. All thoughts, opinions, recipes, photography, random tangents and incoherent ramblings are my own. 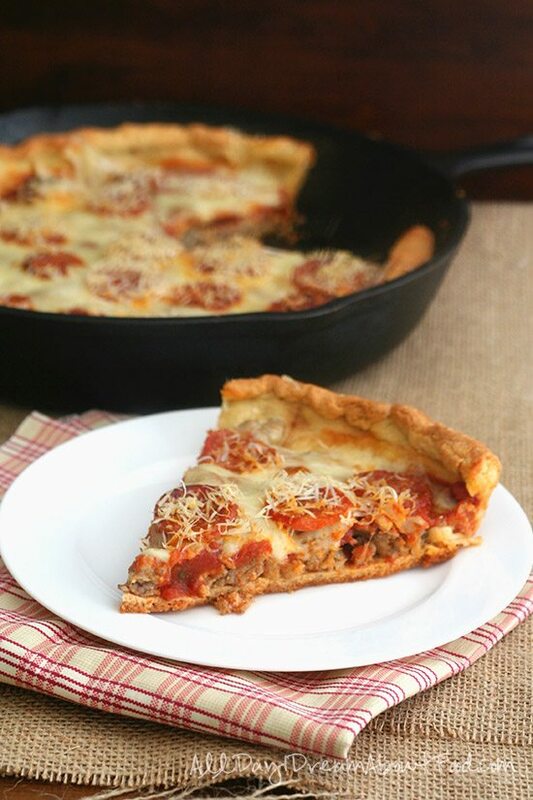 A deep dish Chicago-style pizza made low carb and gluten-free. This is the low carb pizza recipe you've been looking for! Preheat oven to 325F and lightly grease a 12 inch oven-proof skillet (preferably cast iron but regular skillets will work well too). Turn out dough onto a large piece of parchment, and then pat into a rough circle. Top with another piece of parchment and roll out to a large circle about 14 inches in diameter and 1/4 inch thickness. Peel off top piece of parchment paper. Carefully flip crust with bottom parchment still attached into prepared skillet. Gently peel parchment off (don't worry if it cracks or breaks a little, it's easy to patch back together). Press crust into pan evenly and push down the edges of crust to below the edges of the skillet. Crimp edges of crust a bit. Bake for 10 minutes, then remove and set aside while preparing the filling. In another large skillet over medium heat, brown sausage until cooked through, breaking up clumps with the back of a wooden spoon. Lay half of the mozzarella slices over the bottom of the crust, making sure to cover it well. Top with cooked sausage. Spread sauce over sausage, sprinkle with garlic and oregano and layer remaining mozzarella slices over sauce. Top with additional cooked sausage or sliced pepperoni, if desired. Sprinkle with parmesan cheese. Cover the edges of the crust with strips of tin foil and bake pizza 30 minutes, until cheese is bubbly and browned. Serves 10. Each serving has 10.22 g of carbs and 3.54 g of fiber. Total NET CARBS = 6.68 g.
This looks great! Can you tell me, on the sausage is it just breakfast sausage or is it like Italian sausage or something else? It’s similar to the Jimmy Dean bulk sausage (I guess that’s breakfast sausage?) but without all the junk. This looks wonderful! 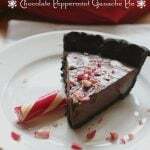 Do you think this would work baked in a glass pie pan? I don’t have an iron skillet although I do have stainless steel. So which would produce better results, glass or stainless steel? I make pies in a Corning Ware pie pan and the crust crisps up and just about slides around. Much better than a metal pan. That looks delicious. I was wondering if you know, though, if their pigs are pastured. I couldn’t find anything about it on their website. Jones sausage sounds wonderful,with just natural,ingredients and no fillers. I will look for it at the market. I saved your recipe and am looking forward to having pizza again! Perfect Friday post, ’cause Friday is Pizza Day at my house. This looks amazing! Do you have any suggestions for a replacement of the whey protein powder? You can use hemp protein or powdered egg whites. I can’t resist the smell of good pizza either. Pizza is a staple in our house. I can’t wait to try your recipe. It’s mouthwatering. Big fan of pizza and also Jones Dairy Farm products so this is a win win for me! That crust looks as close to the real thing as you can get and still be low carb – can’t wait to try this out!!! This looks good. I’m not the pizza fan most people are because I worked in the industry for about 5 years as a young adult. Just ate too much of it. For me, pizza is what you have when you don’t feel like cooking and want something fast and easy. That said, I do like pizza-like casseroles so this really appeals. Looks wonderful, and I’m not a pizza junkie. But I’m confused: At the top of the recipe, it says Yield: 10 Servings, but in the Nutritional Information it is based on 12 servings. This looks amazing, Carolyn, but I have a question. Can you taste the coconut flour in this at all? I absolutely cannot stand the taste of it, even though I like coconut. No, don’t leave it out and no, you can’t taste it. It helps stiffen the dough and make it more workable in this recipe. This is a most excellent excellent idea. Although – living in Chicago – maybe it’s just easier to order one up! Thanks for the post! I am doubtful you can order a low carb, gluten-fee pizza in Chicago or ANY city! I am new to using cast iron pans…how do you prep it for this recipe? Thanks!! I’d also love a clarification on serving size. 10 or 12 servings, as both are stated. 10! Are they still both stated? I thought I’d fixed that. The nutritional info was run on 10 servings. This little 12 in pizza serves 10 people…at almost 7 g carbs each? Hopefully it’s filling or I’m breaking my carb limit just to get my fill. Looks delicious though. I want that whole pie!!! This pizza looks amaaaaze! how is it that, still, people seem to think gluten-free means “healthier?” It doesn’t….it’s a better option for people with celiacs that cant digest gluten, but for the rest of us…it doesn’t harm you. Actually, it does harm you. A lot. A great deal of research is leading many people to this conclusion. And as someone with diabetes, it certainly harms me, sending my blood sugar soaring. Please think about your statement a little, because it’s off-track. I hope you will report back! Lol! Guess I forgot to to give an update! It was pretty good, a bit of work, though. As with any pizza “substitute”, it isn’t exactly the same as a “real” pizza but this was pretty darn close. One piece makes a meal because it is so dense. I haven’t made it again but I plan too very soon. 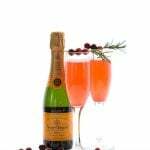 Thanks Carolyn for this and all your other fabulous recipes! I did make this pizza and it was very good. There was to much for me so I cut it into slices and put it in the freezers. Really good. I live in Hong Kong so not able to buy the sausage. Can you suggest an alternative? Whatever meat or other fillings you want! 🙂 Ground beef would be good, maybe seasoned a little with some hot pepper. THANK YOU, this may be the pizza recipe I’ve been searching for! I’ll be starting (another) low carb diet soon and this sounds absolutely fab!! But help me out here, I live in Holland and the pizza’s we buy in the supermarket are about 350-450 grams (3/4 – 1 pound) and to me that’s a MEAL! I can’t work out the total weight of your recipe cause you don’t use weights, but is 1/10th of this pizza a snack, or is the thing so humongous that it constitutes 10 meals? Just love, love, love your blog, keep up the good work!! For me, it was a meal. I am small, mind you, but my husband is very tall and typically eats 2x what most people eat. He could barely finish two slices. Round out your meal with some low carb veggies and you will be all set. It depends on what you eat if it’s filling or not. The photo looks perfect – as in perfectly delicious! And the best thing about your recipes is that even in my kitchen the final product comes out pretty close to what yours look like, and always yummy. Thanks!! I made a vegetarian version tonight. Black Olive, mushroom and pesto and it turned out great! Thank you! We liked this quite a bit after making it for dinner last night. Although we can typically get Jones sausage at our supermarket, it was out if stock yesterday so we went with a pepperoni and black olive combo. Very tasty! It would be great to figure out a way to add a little chewiness to the crust, but to be fair, that’s my wish with any gluten free bread-like items. The flavors were great, and although I haven’t added fresh minced garlic to my pizza in the past, that’s a definite “do” for the future. This took a little patience, so I will likely save this recipe for weekends, but I totally enjoyed picking up a slice (okay, two!) and eating a non-soggy piece of pizza that didn’t kill my carb count for the day. this pizza looks wonderful ! I will try it this week. But I have difficulties with the measurements. How much (gram) is a cup? I live in Germany and we have huge cups for cafe-latte or small cups for german coffee…. I am not sure it will be exact so I hope it works! I am wondering about the xanthum gum. Where can you get it or can you leave it out? Your crust won’t hold together as well, but if you absolutely can’t find any, leave it out. I get mine in the GF section of my grocery store but it’s available on Amazon too. Can I use glucomannan instead of xanthum gum? I’m scared to use glucomannan though. I’ve been disappointed because in most of my recipes that calls for glucci, it seems to just glob up into chewy balls, even over heat. Maybe xanthum gum is different? 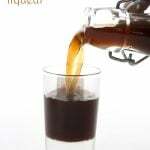 I have never used glucomannan so I really can’t say but from what you describe, you would be much better off with xanthan! I brought mine through Iherb. Very good price and really fast delivery to Hong Kong. This looks absolutely scrumptious! Can’t wait to try it. And we love, Love, LOVE Jones sausage. It is absolutely delicious and very decently priced. And I’ve been very impressed with the company in the little bit of interaction that I’ve had with them. So glad you can spread the word about them! This looks delicious. I am wondering if the whey powder is necessary? Can it be omitted? This looks delicious! I’m wondering, however, if the whey powder can be omitted? Whey helps the crust rise and hold its shape. If you omit it, you will have a flatter, less interesting crust. However, you can also use hemp protein or powdered egg whites. Are you saying that you can use ground hemp seeds in place of the whey? No. There is hemp protein powder, you would want to use that. Ya the sauce should be just stewed tomatoes with some seasoning and on top the the cheese. 😉 Other wise this looks great! Thank you! I agree with you and that’s how I usually make my own tomato sauce. But some folks like to buy ready-made. Chicago style pizza is my absolute favorite!! I love Jones Dairy Farm sausages. I always have a bag of their links from Costco in my freezer. I will have to try this! I saw that it’s possible to switch out the whey for hemp protein, and I think I may try that substitution. Thanks! Question:Can I make the pizza crust and freeze it for another time?Also my grand daughter who is 4 just had a check up and the doctor said her BMI is too high and she want her carbs in her snacks to under 7 g. Do you have any easy snacks that are easy to make and under 7 g, because I know that the gluten free things are so high in carbs and that causes her blood sugar to go sky high. We need something Easy. Yes, I think you could freeze the crust (after the first baking) but I can’t say for sure because I didn’t try it. My little granddaughter likes just about everything. She loves fruit and veggies, cookies, what little one doesn’t like them once in awhile. We just need to make something as far as cookies that we could freeze.So hard when she needs a snack at least 3x a day I will try to make the pizza crust and freeze it. I will let you know how it turns out. 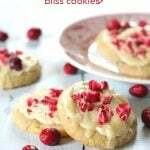 These are my favorite chocolate chip cookies, the coconut gives them a wonderful texture. We made this tonight and liked it a lot! I don’t have a skillet to use so I used a pie pan. I will try to get a bigger one for next time as the crust was a bit thick. Thanks so much for all your recipes they are all so good! I made this last week, it was fabulous, even my low-carb skeptic adult son loved it! Since the original is in a 9-inch pie pan, I increased all the filling ingredients by about 1/3. Absolutely delicious! Another comment… I did not add a layer of cheese on the bottom for the quiche, and the crust was just fine, not soggy at all. I suspect that the pizza may be the same, although there’s nothing wrong with an extra layer of cheese! To speed up construction, I just used shredded mozzarella for the second layer of cheese, and next time I think I’ll purchase the mozzarella at the deli and see if they’ll thinly slice it for me. Also, I added sliced fresh mushrooms and black olives. Yummm. I think I’ll also use this crust for my favorite quiche recipe, but instead of layering cheese on the bottom, I’ll brush the pastry with beaten egg prior to baking the crust for 10 minutes. I like to freeze that particular quiche recipe and intend to give it a try using this crust to see how it freezes. SO excited to try this recipe! Just out of curiosity (I might try it anyway just for experimentation purposes), can you use a slow cooker instead? I don’t have an awesome skillet like that, but I would definitely like to make this! I am very doubtful you could cook this in a slow cooker. They keep in too much moisture and your crust won’t firm up properly. But you can cook it in a pie pan. Do you think vanilla whey protein powder would be ok to use in this? No, not at all. It would give the crust a sweet vanilla flavour and you really don’t want that. Would it be possible to sub part (1/4 – 1/2) of the almond flour with flaxmeal? Made this last night and it was WONDERFUL!!! DH loved it as well, and he is not too keen on almond or coconut flour. Thank you for the great recipes and your awesome creativity. Love your blog! 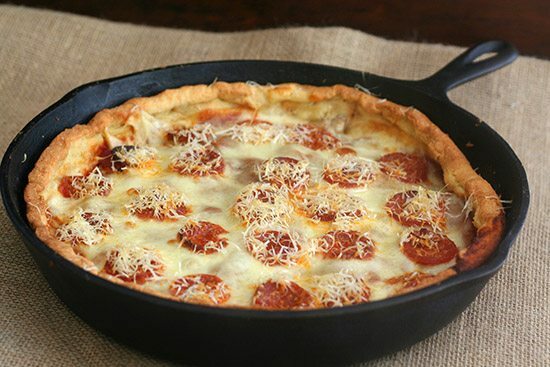 Hi, I know this recipe is for the deep dish sausage pizza casserole-y thing, but I was wondering how well this crust would do as a normal, thick, pan pizza type crust. If i layed it out in a pan and baked it, then added sauce and cheese and veggies. We don’t eat meat, but I’ve been searching for a good low carb pizza crust and came acros yours. Have you ever used it as a regular pizza crust? Yes, I have and it’s great! Oh, one tip…make sure to roll it out on parchment and keep it on the parchment while you bake. But you can bake it on a pizza stone to get it nice and brown on the bottom, even through the parchment. Can you use hemp protein or powdered egg whites? The extra dry protein helps the dough be lighter and flakier. More crust like! So amazingly fantastic Carolyn! No sausage but I used prochuttio & roasted veggies (peppers/onions) & sautéed mushrooms & fresh tomatoes. My husband can’t believe how good it is….enough for our dinners all week. Many thanks for your awesome service. Hope you and your family have a fantastic Christmas in your new community. Thank you, Anne. And prosciutto and roasted veggies sound amazing! This was excellent pizza! One serving with a salad (and red wine, of course) is completely satisfying. As I have a slightly smaller skillet, I used most of the dough for the deep dish recipe as written, but rolled a small quantity out to a flat pizza. Used the same trick with the sliced mozzarella against the base and worked really well. I was able to pick it up with my hands without it flopping sauce all over my shirtfront. Success! Just a note to add that I froze one slice, rewarmed on parchment, from frozen, in a slow oven – tasted even more fabulous the second time around! What can I substitute for unflavored whey protein and the coconut flour? I have peanut flour and oat fiber. Or golden flax seed or meal? Any suggestions would be so helpful. You can sub oat fiber for the coconut flour and leave out the protein powder (crust won’t rise as much but it should still be good!). Thank you! So excited to try this. So could be no one is still following the comments here, but I have now made this pizza three times and it is a great hit, even with my non-low carbing kids. However, my skills at rolling out dough are zero, and I quickly gave up and simply pressed the dough into the oiled pan. SO MUCH EASIER. I love how I can make and bake the crust to the first stage, let it cool and then fill to be baked later. I am all about convenience where it can be found. In this world, eating low carb is definitely more work than picking up a phone and having something delivered! P.S. This crust was amazing. I can’t imagine a cauliflower or egg/cream cheese crust working as well. I made this for dinner tonight. So delicious! And very filling as well. Thanks for the great recipe. Wow. This is really excellent. The crust was a little dry but the flakey quality was really nice. I wonder if I buttered my pain instead of using Pam to grease it if it would’ve given it a little more moisture. Regardless, this is the absolute best pizza crust alternative that I’ve tried. Oh, and it doesn’t hurt that we LOVE deep dish pizza. Thank you for the great recipe!! 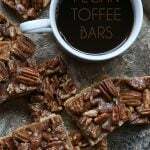 I know this is not a new recipe, but it is new to me, and it is wonderful!!! I made it tonight for dinner and the three of us here — me, my hubby, and daughter — just loved it. It was beautiful, first of all, I took a picture of it I was so impressed. And it was delicious! The crust was just right, and the fillings and toppings were balanced just right. Thank you so much for taking the time to develop these recipes. What a difference this makes being able to eat deep dish pizza without 1,000 carbs! Just wanted to tell you I was out of almond flour so I made this with hazelnut meal. It took an extra egg and one more tablespoon of butter for the dough to come together, but it came out very well. The end result was a lot like a whole wheat crust, and was stiff enough to pick up like normal. 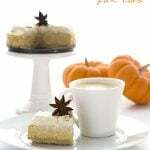 First, thank you so much for sharing all of these wonderful recipes! I made this pizza today and, although it’s the best low carb pizza crust I’ve tried so far, I’m still hoping to find one that tastes more like the real thing. If I make this one again, I’ll press the crust into the pan instead of rolling it and trying to transfer it to the pan…that attempt ended up being an epic fail. I was able to easily peel the top layer of the parchment off but, when I flipped it over into the pan the bottom layer was really stuck. Peeling it off was impossible so I ended up patting most of it into the pan anyway. I was afraid it would stick and not come out of the pan easily for serving but it was fine. Pressing it in would eliminate the rolling step, which would make it even easier to make. I did use a cast iron pan (greased with a little lard) and the crust was a perfect golden brown. This is so delicious. The crust is a tiny bit dry, but tastes great. It totally satisfied my pizza cravings and there are leftovers. Thanks for the great recipe, first low carb pizza I’ve made. Do you think Pysillium Husk powder could be used instead of the protein powder? I finally bought some, and now can’t find any recipes using it. ? My family liked this pizza a lot, which was a relief because I wanted to make them a healthy crust. Thank you because the crust was fairly easy to make. Thanks! I want to make it a regular crust on a pizza stone next. I used egg white powder for the protein powder. 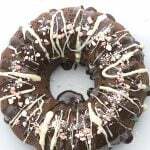 Looks greatbut hubby is allergic to all nuts, which would inxluse almond flour and coconut flour, any ideas? Oh dear, I am sorry I don’t have too many good ideas. The almond flour can be subbed with some sunflower seed flour but not so sure about the coconut. Maybe oat fiber? Wait a minute. You’re pulling your nutrition info from 10 portions of a skillet pizza? Those are some tiny portions. I could make a low carb maple syrup by portioning 1/10th of a gram of ordinary maple syrup. Am I missing something, or is this a total fraud? How about you actually try it and see just how filling a piece of this pizza actually is. This was sooooo amazing. I didn’t have whey protein so used powdered egg substitute. My husband and I made this last night as our Date Night At Home dinner. We’ve been trying different keto pizza recipes, and have never been happy with the results. This is, by far, the best keto pizza recipe I’ve tried! It’s so close to my favorite pizza restaurant’s crust texture that it was amazing! We used only a half pound of mozzarella slices, will try the thicker slices next time. Going to try making this for the super bowl tomorrow. Very grateful for all of the comments, and for the fact that you took the time to respond to nearly every one. (Even the incredibly repetitive ones!). Thanks!